Kenny Walker hails from the tiny town of Crane, Texas and went to college at Nebraska. At 6’2″, 246- Kenny was considered a bit undersized but made up for it with his quickness and agility. After being a situational starter throughout most of his career he really came on as a senior posting 73 tackles, 21 for losses, 11 sacks and a forced fumble culminating with him earning 1st team honors from the AP, and Big 8 defensive player of the year in 1990. 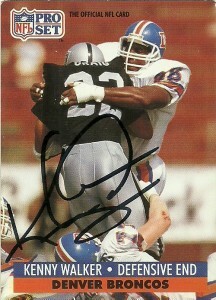 He parlayed his performance and accolades into an 8th round pick of the Denver Broncos in 1991. 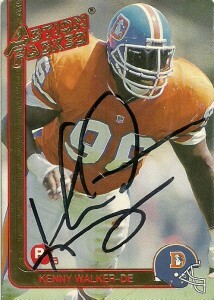 The Broncos were restocking on defense following a 5-11 season, and added Mike Croel and Keith Traylor in the earlier rounds. Walker would be a surprising find for the Broncos and start all 16 games that season recording 3 sacks, and follow up the next season with 1.5 sacks and 2 fumble recoveries. The most amazing part about all this is that Walker did this all with a hearing impediment. In essence, he has been deaf since the age of 2 when he suffered a bout of Meningitis. 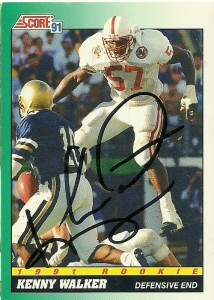 Kenny then played in the CFL for the Calgary Stampeders from 1994 to 1995, and the Winnipeg Blue Bombers from 1995-1996. He’d be the first deaf person to play in the CFL. Kenny then hung up his cleats went into teaching and coaching deaf children at both the High School and College level. Currently in 2013 Kenny is coaching in Highlands Ranch, Colorado. He’s written an autobiographical book entitled “The Roar of Silence”, and at this time remains a role model and upstanding member of the deaf community.